CENTER VALLEY, Pa., May 18, 2017 /PRNewswire/ -- Olympus, a global technology leader in designing and delivering innovative solutions for medical and surgical procedures, among other core businesses, announced today the availability of the new ViziShot 2 single use aspiration needles, expanding the device portfolio for Endobronchial Ultrasound Transbronchial Needle Aspiration (EBUS-TBNA), a minimally invasive alternative to a surgical procedure and considered the gold standard for lung cancer staging. The new needles, to be unveiled at the American Thoracic Society (ATS) Annual conference, will expand the line of devices from Olympus, offering improved access, usability and puncture of difficult-to-access lymph node targets. 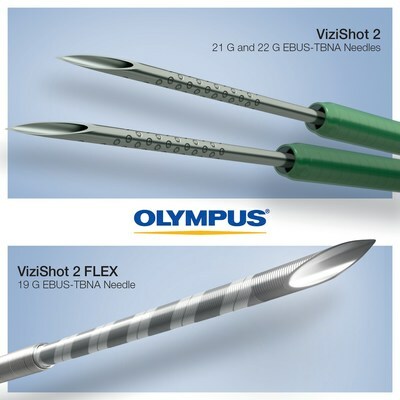 In addition to the ViziShot 2, Olympus will demonstrate its continued commitment to pioneering in the EBUS-TBNA field by introducing the ViziShot 2 FLEX 19 G needle, that features a brand new ergonomic handle. When used with the Olympus BF-UC180F 2.2mm channel EBUS bronchoscope , it provides up to 84 degrees of angulation to help physicians gain access to the most difficult lymph node stations, such as 4L, with ease. This needle has the largest inner lumen currently available in the United States, ensuring improved sample acquisition for advanced molecular testing and enabling physicians to obtain ample quantities of the high-quality specimens needed for a comprehensive histological analysis, especially when diagnosing sarcoidosis and lymphomas. In July 2013, The U.S. Preventive Services Task Force (USPSTF) announced new recommendations for lung cancer screening for people at high risk for lung cancer, leading to increases in CT screening. Around the same time, the American College of Chest Physicians changed its lung cancer guidelines, now recommending Endobronchial Ultrasound over surgery for lung cancer staging. Many of these patients require follow-up care that could, by USPSTF estimates, prevent roughly 14% of the 160,000 lung cancer deaths each year. Recent CMS increases in reimbursement for procedures related to lung cancer diagnosis allow hospitals to more readily build their lung cancer program. The new EBUS needles will be showcased at the ATS annual conference May 19-24 in Washington, D.C., booth # 923. To learn more about pulmonary therapeutic devices from Olympus, please call 1-800-848-9024 or visit us at http://medical.olympusamerica.com.